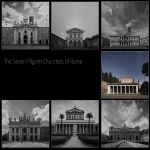 The Seven Pilgrim Churches of Rome are seven ancient and major churches in Rome, central to a religious pilgrimage to the city. 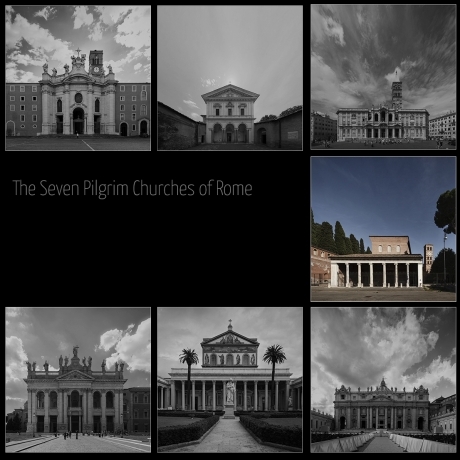 As the home of the Pope and the catholic Curia, as well as the locus of a many sites and relics of worship related to Apostles, Saints and Christian martyrs, Rome had long been a destination for pilgrims. Periodically, some were propelled to travel to rome from the Spiritual benefits, including indulgences accrued through a papally sanctioned Jubilee. These indulgences require a visit as a pilgrim to these specific churches though not in a specific order. This tradition is related to the work of St. Philip Neri, who devoted his life to help pilgrims. Built originally in the first half of the 4th century, the basilica is dedicated to St. Sebastian, a popular Roman martyr of the 3rd century. The name ad catacumbas refers to the catacombs of St Sebastian, over which the church was built, while "fuori le mura" refers to the fact that the church is built outside the Aurelian Walls, and is used to differentiate the basilica from the church of San Sebastiano al Palatino on the Palatine Hill. The building was refounded under Pope Nicholas I (858-867). In the 13th century the arcade of the triple nave was walled in. The current edifice is largely a 17th-century construction, commissioned by Cardinal Scipione Borghese in 1609 from Flaminio Ponzio and, after Ponzio's death in 1613, entrusted to Giovanni Vasanzio, who completed it. 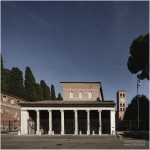 The basilica was founded by the Roman Emperor Constantine I over the burial place of Saint Paul, where it was said that, after the Apostle's execution, his followers erected a memorial, called a cella memoriae. This first edifice was expanded under Valentinian I in the 370s. As it was dedicated also to Saints Taurinus and Herculanus, martyrs of Ostia in the 5th century, it was called the basilica trium Dominorum ("basilica of Three Lords"). Under Gregory the Great (590–604) the basilica was extensively modified. The pavement was raised to place the altar directly over Paul's tomb. A confession permitted access to the Apostle's sepulcher. The new basilica has maintained the original structure with one nave and four aisles. It is 131.66 metres long, 65 metres wide, and 29.70 metres high, the second largest in Rome. 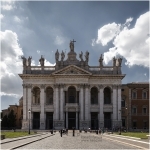 The Papal Archbasilica of St. John Lateran is the cathedral church of the Diocese of Rome and the official ecclesiastical seat of the Bishop of Rome, who is the Pope. 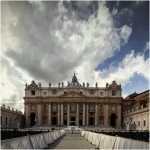 It is the oldest and ranks first among the four Papal Basilicas or major basilicas of Rome. As the cathedral of the Bishop of Rome, it ranks above all other churches in the Catholic Church, including St. Peter's Basilica. For that reason, unlike all other Roman Basilicas, it holds the title of Archbasilica. stands over the remains of the Castra Nova equitum singularium, the 'new fort' of the imperial cavalry bodyguard established by Septimius Severus in AD 193. An inscription on the façade, Christo Salvatori, indicates the church's dedication to "Christ the Saviour". The Basilica of the Holy Cross in Jerusalem is a Roman Catholic parish church and minor basilica. The basilica was consecrated around 325 to house the Passion Relics brought to Rome from the Holy Land by St. Helena of Constantinople, mother of the Roman Emperor Constantine I. Original basilica's floor was covered with soil from Jerusalem, thus acquiring the title in Hierusalem - it is not dedicated to the Holy Cross which is in Jerusalem, but the church itself is "in Jerusalem" in the sense that a "piece" of Jerusalem was moved to Rome for its foundation. The church was also modified in the 16th century, but it assumed its current Baroque appearance under Benedict XIV (1740-1758). The façade of Santa Croce, was designed by Pietro Passalacqua and Domenico Gregorini. Designed principally by Donato Bramante, Michelangelo, Carlo Maderno and Gian Lorenzo Bernini, St. Peter's is the most renowned work of Renaissance architecture and remains one of the largest churches in the world. It holds a unique position in the Christian world and as "the greatest of all churches of Christendom" as was built in the burial site of its namesake Saint Peter who was commissioned by Jesus of the construction of his temple. The façade of the basilica, with a giant order of columns, stretches across the end of the square and is approached by steps on which stand two 5.55 metres (18.2 ft) statues of the 1st century apostles to Rome, Saints Peter and Paul. 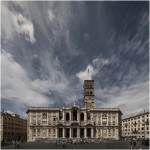 The Basilica di Santa Maria Maggiore is the largest Catholic Marian church. It may still sometimes be referred to as Our Lady of the Snows and even if located in Italian territory enjoys extraterritorial status similar to that of foreign embassies. It is agreed that the present church was built under Pope Sixtus III (432-440). 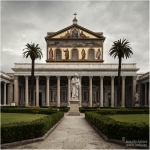 The original architecture was classical and traditionally Roman perhaps to convey the idea that Santa Maria Maggiore represented old imperial Rome as well as its Christian future. The Marian column erected in 1614, to designs of Carlo Maderno is the model for numerous Marian columns erected in Catholic countries in thanksgiving for remission of the plague during the Baroque era. 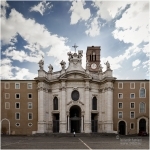 The Papal Basilica of Saint Lawrence outside the Walls is a Roman Catholic parish church or minor basilica and one of the five Patriarchal basilicas. St. Lawrence outside the Walls is assigned to the Patriarchate of Jerusalem. The papal basilica is the shrine tomb of the church's namesake, Saint Lawrence, one of the first seven deacons of Rome martyred in 258. Pope Pius IX, who has been beatified, is also buried at the basilica. Before the present-day basilica was constructed, the estate upon which it sits was once home to a small oratory built by Emperor Constantine I. The emperor built it over the site on which it was believed that Saint Lawrence was executed. The campanile was built in the 12th century. Our Lady of Divine Love is a Roman Catholic shrine dedicated to the Blessed Virgin Mary built in 1745 The church was included by Pope John Paul II in the pilgrimage of Seven Pilgrim Churches of Rome during the Holy Year 2000. The History reports thet one of the tower of a gatehouse, known as "Castel di Leva", was decorated with a medieval fresco, a votive image of the Madonna and Child. In 1740, a pilgrim was attacked by angry dogs, adjacent to the gatehouse, and was reported to have been saved through the intercession of the Blessed Virgin Mary. As a result of the number of pilgrims drawn to this site, a chapel was built, and the image of the Madonna was transferred to it. For this reason Pope John Paul II decided to include the shrine in the Seven Pilgrim Churches of Rome and the corresponding pilgrim itinerary for the Holy Year 2000, replacing San Sebastiano fuori le Mura.